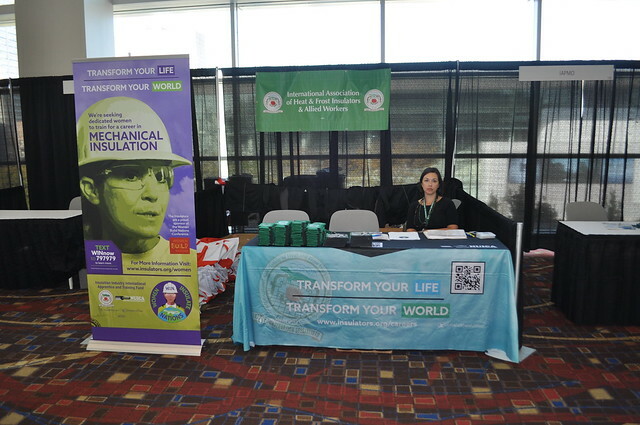 In October, 46 women Insulators were on hand to represent the HFIAW during the North America’s Building Trades Unions (NABTU) seventh annual Women Build Nations Conference in Chicago. The HFIAW and IIIATF worked with Local Unions to create advance awareness about the event, including financial assistance for Sisters who wanted to attend. The strong showing of women Insulators included everything from apprentices to members who are only weeks away from retirement. They came from 24 different Locals, throughout the United States and Canada. Overall, the conference hosted more than 1,400 women in trades from the U.S., Canada and India to the event. “We are making history this weekend,” said Lisa Ford, Women Veteran Program Manager at Helmets to Hardhats, during the opening meeting. One of the most prominent speakers during the conference was Missouri State Senator and Missouri Building and Construction Trades Council President Sister Gina Walsh. Walsh retired five years ago following a 38-year career with Insulators Local 1 in St. Louis. Her goals and aspirations to continually give back and serve the union that gave her a career led her to the elected positions of State Senator and State Building Trades Council President. Earlier this year, Sister Walsh made history by becoming the first female member of the Insulators Union to address the entire delegation at the 31st Quinquennial Convention. Sister Walsh’s speech included several calls to action, including a challenge that all members get involved and be responsible for what is going on in their Local union and the political climate around them. “You choose how to act, what to get involved with, how to serve and ultimately what the future looks like; and I think the future looks feminine!” she said. Walsh continues to be a positive influence for woman in the trades, including her daughter, Kathleen (Casey) Walsh, a fourth-year apprentice with Local 1 and conference attendee. The three-day conference included more than 55 breakout topics in four sessions. Three of the breakout topics included members of the HFIAW. The session called, “Rising to a leadership role in the union: Examples and advice,” featured panelist Kim Patrick, President of HFIAW Local 18 in Indianapolis. In the session, Patrick interacted with the attendees as she gave a personal account of her journey to an elected position within Local 18. She said the experience she has is derived from her passion and commitment to serving the union, she said. Many of the Insulators attended this session to support their Sister. As such, attendees were broken into many smaller groups so that they could learn from one another about the types of leadership roles and experience they have collectively achieved. “We’ve got apprentices, journeywomen, trainers, leaders and the Missouri Building and Construction Trades Council President and state Senator,” said Natalie Quick, an apprentice from Local 1, when introducing her breakout group that included Walsh. This same session was offered at a different time and featured Chip Gardiner, Insulators Government Affairs Director and conference liaison as the moderator. In the session titled “Surviving and thriving in the trades,” Sister Delia Alfich, from Local 17 in Chicago, was a featured panelist. She serves on the Chicago Women In Trades (CWIT) Board. This session included many accounts of what is it like to be a woman in the trades, what you should expect going to the jobsite and what is expected of you. Giving realistic outlooks to potential sisters in the trades will help retain the best possible workforce. “This event is so empowering. It is great to see this many women in one place and get to know my Sisters from other Locals,” said Janice Matlock from Local 110 in Edmonton, AB. There was also a session called “Tools of the Trade,” during which many attendees visited the Insulators who made beverage koozies out of elastomeric foam insulation. This gave many of the Insulators a chance to explain the type of work insulators perform to the other attendees. The materials and table were provided and staffed by members and instructors of HFIAW Local 17. A special thanks goes out to all of the members, training instructors and attending Sisters from Local 17, who served as unofficial hosts for all the HFIAW attendees. The HFIAW would like to thank all of the women who attended this conference and represented the Insulators Union. The Sisters in attendance at the 2017 Women Build Nations Conference included: Lindsey Dischbein, Natalie Quick, Ashley Selby, Gina Walsh, Kathleen (Casey) Walsh and Matyka Salazar from Local 1; Nicole Cain and Samantha Lippert Kendall from Local 2; Wendy Kistner and Ebonie Bridges from Local 3; Donna DeLong and Melissa Gustafson from Local 6; Le Traya Lee from Local 7; Faith Schaub from Local 14; Delia Alfich, Kathryn Bailey, Erica Bouley, Natalie Dominguez, Jennifer Frank, Jeri Gandy, Alexandria Gray, and Jolene Raudio from Local 17; Rachel Juras and Kim Patrick from Local 18; Tara Minnich from Local 23; Krista Williams from Local 30; Lisa Schmidt and Lindsey Skeie from Local 34; Angela D’Esposito, Maxine Lachnite-Pelker and Cheri Waggoner from Local 36; Lynette Jones and Amber Ledford from Local 45; Heather Wilson from Local 47; Latairra Pete from Local 76; Isabel Ortega from Local 78; Terry Atchison from Local 82; Geraldine Wagenhoffer from Local 89; Lindsay Mann from Local 99; Janice Matlock from Local 110; Ashley Duncan from Local 118; Erica Schneider from Local 127; and Tracy Allen and Ann Lambert from Local 207. There were also five Insulator men who attended the conference: Instructor Sean Craven and Training Coordinator Robert McGuckin from Local 17; Training Coordinator Phillip Wilson from Local 47; Government Affairs Director and conference liaison Chip Gardiner; and IIIATF Administrator Tom Huan. It was announced at the end of this conference that the 2018 Women Build Nations Conference will be held in Seattle.